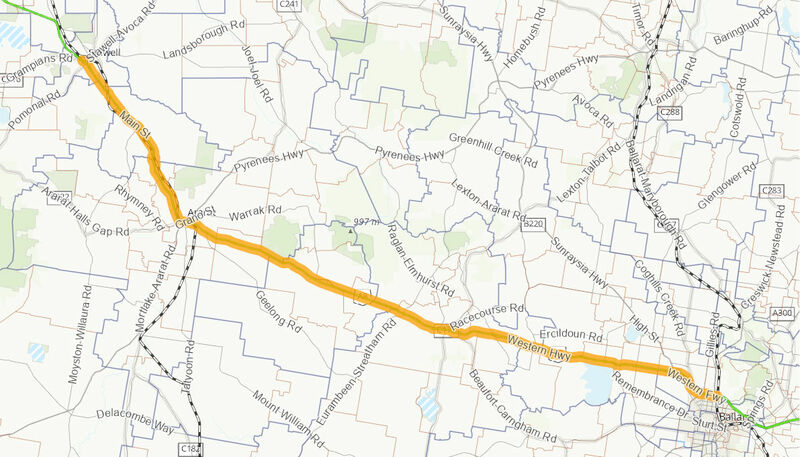 The project will increase capacity, reduce transit times and improve traffic flow and safety for the 5,100 to 6,400 vehicles that are estimated to use the Western Highway between Ballarat and Stawell each day. The project will also improve access for local communities and reduce driver fatigue. Once ITS becomes fully operational, the project will also advise drivers of current or upcoming traffic conditions in the event of an emergency or accident. This will allow drivers to make informed decisions about their intended route and reduce the need for lengthy delays or detours. The estimated cost of the project is $659.74 million. The Australian Government is contributing $499.38 million and the Victorian Government $160.36 million. Construction commenced in March 2010 and is expected to be complete in mid-2020.